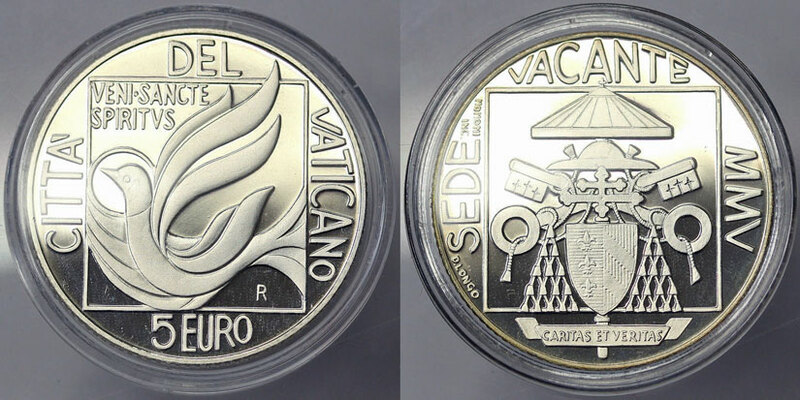 2005 Sede Vacante 5 Euro silver coin for the interregnum period after the death of John Paul II and before the election of Benedict XVI. Obverse: Arms of the Cardinal Camerlengo and of the Apostolic Camera (two crossed keys surmounted by the papal umbrella). Reverse: The dove, symbol of the Holy Spirit. Sculpted by Daniela Longo and engraved by Claudia Momoni. Includes original plush case and certificate.